As described above the heat transfer rate can be optimized by varying the rifling geometry based on operation conditions. In addition to the standard rifle tubes (covered in this brochure), ISMT manufactures rifled tubes to suit any customized geometry and in all boiler steel grades. We regularly manufacture and deliver such customized solutions at short notice. With over 25 years of experience in the production of precision seamless tubes for the Powergen industry we can guarantee the quality of all our tubes. The entire production process, the melting of steel, the manufacture of the hot-finished tube, the cold drawing, and the final heat treatment to obtain the desired metallurgical properties is carried out in-house. Each and every tube is then ultrasonically and/or eddy current tested to ensure quality. Rifle Tubes can be supplied against ASTM, ASME, A/SA 192, 209, 210 and 213 specifications and all associated grades. Tubes can be supplied against equivalent specifications like EN 10216, DN 17175, BS 3059, JIS 3461 – 3462. 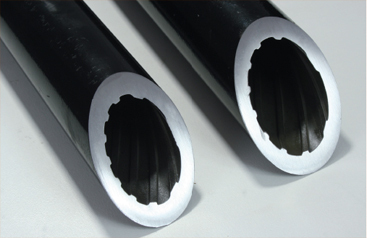 Tubes can be supplied to bath A and B type profiles. Detailed dimensions for each profile are given in the table. 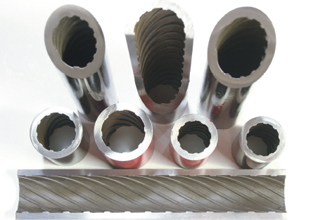 We manufacture tubes in every possible boiler grade steels. All our steel is melted in-house through electric arc furnace route, than is ladle refined, 100% vacuum degassed, continuous cast and rolled. ISMT is ISO 14001, ISO/TS 16949:2002, and OHSAS 18001 approved. In addition we hold approvals from all major national and international official authorities, customers, and third party certification agencies. H Specified rib height +/-0.30 mm +/-0.012 in. L Rib radius (top and bottom of the rib) form 0.4 to 2 mm 1/64 to 5/64 in. M Pitch(rib lead) - +/-3.18 mm +/-0.125 in. N Lead +/-3.18 * E mm +/-0.125 * E in. S Rib width at top(longitudinal) 8.28 mm 0.326 in. +/-1.27 mm +/-0.050 in. mm in. mm in. mm in. mm in. Kg/m Lb/ft mm2 Sq in. mm in. F Pitch(rib lead) - - +/-3.18mm +/-0.125 in. G Lead - - +/-3.18*D mm +/-0.125*D in. H Rib width at the top(longitudinal) 5.59 mm 0.220 in. +/-1.27 mm +/-0.050 in. (1) The average rib height of all the ribs should fall without the proper value of +/- tolerancein the following table. The maximum deviation on anyrib height from specification values should not exceed the +/- tolarance by more than 0.003 in.